Nutshell Lets You Take A Break From The World | OhGizmo! Considering products like the Cozy Room (an isolation room) exist, it’s tempting to think the world is becoming increasingly hectic, enough so to warrant physical separation from your surroundings. And perhaps it is, so we won’t pass judgement on the Nutshell. 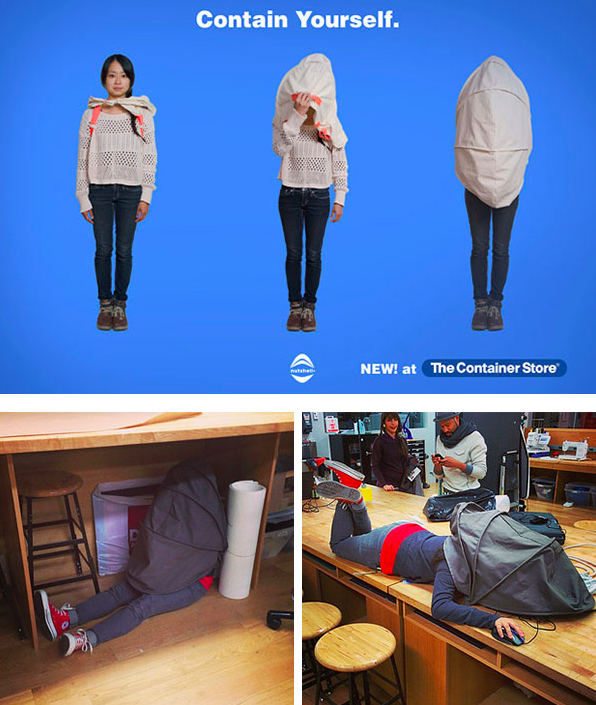 It’s a simple… tent that unfolds around the upper portion of your body and allows you so block out the outside world. The visual part, anyway. With it, you can read a book even in a crowded hallway while pretending to be alone. You can take a break from having to interact with people, and you know, socialize. We sound critical, but we’re really not; it’s just a difficult need for us to wrap our heads around, but we acknowledge and respect the fact some may legitimately want this. Sadly, it doesn’t look like you can actually buy Nutshell. It’s the project of New York’s School of Visual Arts design student Eden Lew, and isn’t being commercialized. The bottom left pic is OK, but not as much fun as a blanket fort and flashlight.